/Before Placing my Order /How do I reorder? We keep anything you’ve ordered before, or even saved for that matter for as long as you have your account with us. You can access and reorder very easily. 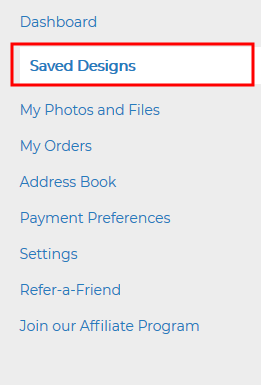 The easiest way to reorder a design from before is to visit your Account Dashboard by clicking the Account icon on the top right of the page and selecting “My Account.” Scroll down to the My Recent Orders section of your Dashboard and you will see a button that says “Reorder.” When you click this button, the order automatically gets sent to your cart. If you want to reorder a design from before, but have to make a few changes, such as dates or names, you can click on the Saved Designs tab in the toolbar on the left side of your Dashboard. Click on what you’d like to order again, and it will take you to a screen that will prompt you to Duplicate Design. When you do this, we copy your design from before, and you can edit and personalize as needed. Once you’ve hit the duplicate button, the order process is the exact same as it was the first time around. Design as needed, and add to the cart, check out when ready. If something doesn’t seem to be going right, give us a buzz here, and we’ll help however we can.